Corporate project teams thrive when they learn from one another’s experiences. If one team does something that works—or that fails spectacularly—others should hear about it and profit from that knowledge. In fact, the capture and transfer of lessons learned can be a differentiator between success and failure in a competitive project-based environment. That proves true across a range of functions and industries, from scientific research and development to large-scale manufacturing and consulting services. In 2017, member-based nonprofit APQC studied six organizations to learn how they manage the knowledge that comes out of large, complex projects. The first two articles in this series discussed reasons to embed knowledge transfer in your project management strategy and the role of virtual communities in facilitating cross-project collaboration and learning. 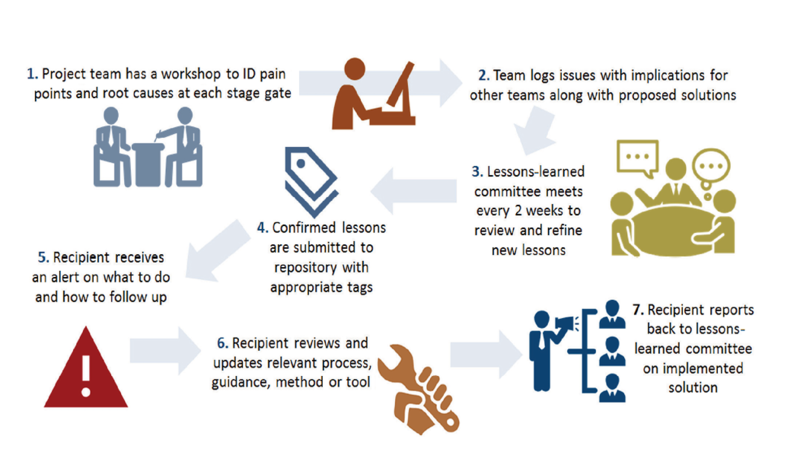 This final article focuses on the role of lessons learned in project KM as well as the value organizations can derive from getting relevant lessons into the hands of others who may benefit. what changes the organization should make or what the team might do differently in the future. The meetings give project teams an opportunity to address internal differences of opinion about decisions and outcomes while building consensus on the best approaches moving forward. Lessons learned conversations also help project managers examine risks associated with their projects and document how the team is managing and minimizing those risks. Among the organizations in APQC’s research, Volvo Group Trucks has one of the most thorough approaches to capture project lessons learned (see Figure 1 on page 26, KMWorld Jan/Feb 2018, Vol 27 or download chart). The following describes the lessons-learned process that Volvo project teams undergo at every stage gate of their projects. 1. In a workshop setting, identify all project pain points and compile a list. 2. Before the workshop can close, identify the root cause of each project issue. 3. Evaluate whether each issue has potential implications for other project teams. 4. For internal project issues, establish a corrective plan within the project team. 5. For external issues, identify possible improvements and log the lessons, root causes, improvements and potential recipients in the lessons learned log for committee review. Volvo has created detailed process documentation, complete with tools and templates, to guide project managers through lessons-learned workshops and help them identify and prioritize relevant issues. In addition, a committee of senior project managers coaches teams as needed to fully refine their KM submissions. The committee also partners with Volvo’s project management office to provide e-learning tools for project teams to leverage on demand.